The new SkyHawk Pro birding series combines premium optics, ruggedness and an ease of use at exceptional value in a slim and high value roof prism design. 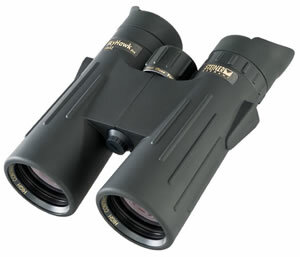 This series has been designed by birders for birders who set value on optical performance, ruggedness and ergonomics. The range is suitable for any kind of birding activity from watching birds in the garden to exploring the rain forests of Costa Rica. 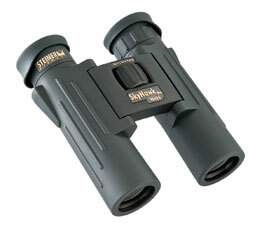 This makes the new SkyHawk Pro series a reliable, trusted companion for even the most demanding birding adventures. 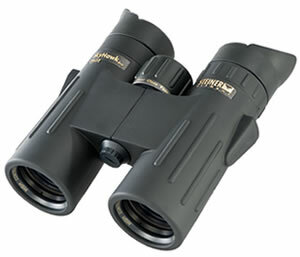 Characterised by a slim, yet extremely rugged construction in a high value design with a bold new look, the new SkyHawk Pro models stand out clearly from typical binoculars. Steiner developed and constructed a completely new roof prism binocular using an entirely new calculated optical system and a new shock and water pressure-proof housing for this versatile roof prism binocular series. Best vision and user comfort are guaranteed!! SLIM, ERGONOMIC AND COMFORTABLE: New twist-up eyecups offer a choice of four positions allowing the user to set the desired eye relief for maximum viewing comfort and make the full field of view available for eye-glass wearers. The unique eye-cups made of skin friendly silicon have fold down flaps on the side to block side light. In its class SkyHawk Pro has a larger-than-average field of view at 1000m, ensuring a good overview. With a close focus range of 2 metres the SkyHawk Pro series provides great observation opportunities even at closest distance. The progressive styling of the XXL focus wheel makes SkyHawk Pro easy to use and focus with or without gloves and in any weather conditions. Protection of the optics is raised way above the standard by use of a new premium high-tech polymer housing. The new material provides higher and lasting precision in optics adjustment, increased corrosion resistance and higher torsional stiffness compared to materials used in other binoculars. Improved resistance against chemicals and corrosion is another positive side effect of the new material protecting the binocular against the harshest environmental conditions. Nitrogen pressure filling with Steiner's unique two-way-valve technology prevents the valuable binocular optics from fogging on the inside and make it water pressure proof to 1metre. Full rubber armouring with imbedded recessed thumb rests ensures a secure grip regardless if wet or dry as well as perfect balance. SkyHawk Pro binoculars are supplied in a high-quality case and are equipped with objective covers, neoprene rain protection cap and comfortable neoprene carrying strap (non-slip, padded and kind to skin). SkyHawk Pro features the ClicLoc Strap System, a clever solution that makes sure your binocular is always firmly secured - yet can be easily detached and reattached in no time. The proven and tested objective covers are securely fastened under the objective with a similar ClicLoc device - safely stowed and always there when needed.The ClicLoc strap and objective cover attachment have been tested as the best and most convenient attachment device in special interest magazines.